We offer excellent personalized service with all custom dental restorative requests for crowns, bridges and implant abutments. We have developed excellent relationships with our doctors and their staff, taking the time to get acquainted with each of our doctors preferences so that our restorations work meets the preferences of each doctor and on every occasion. 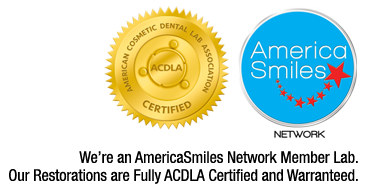 We deliver the most precise fitting and aesthetically pleasing restorations, utilizing the latest technologies and materials, allowing you to provide your patients with the best treatment options available today! you best serve your patients!